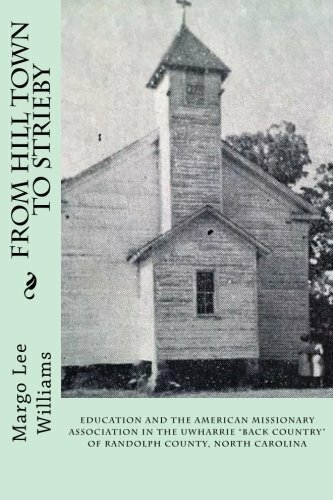 “From Hill Town to Strieby” by Margo Lee Williams is the community history of a small settlement in the Uwharrie Mountains of central North Carolina. It was a community of Quakers and free African-Americans before the Civil War known as “Hill Town.” There wasn’t necessarily a hill there, but property owners in the 1830s included former slaves Ned and Priscilla Hill. With the founding of the Strieby Church and School in the 1880s, the community became known as “Strieby.” But don’t look for Strieby on any maps, whether old or modern. Strieby never was a real town. Rather, it was a scattered rural community of African-Americans anchored by the church and school. The church and school were one of many created by the American Missionary Association (AMA), founded to support rural churches in the South, its’ mission to free blacks, and preach “deliverance” to slaves. North Carolina did not provide public education to black children until the 20th Century, and then it was the “separate but equal” variety. In the Strieby area, the church school was the only source of education for African-American children. The AMA schools undoubtedly provided similar invaluable services elsewhere. “From Hill Town to Strieby” is far too detailed to be of interest to most readers who would otherwise be intrigued by such history. If she has not done so already, Williams should do a much shorter version for a magazine or journal using the Strieby school to illustrate the role of the AMA and the church schools to educate African-Americans before the Civil War, during Reconstruction, and thereafter. The detail she provides is immense. “From Hill Town to Strieby” is incredibly researched and documented. It includes 200 pages of genealogy, mostly of those people buried in the Strieby church cemetery; photographs, both historical and more recent photos of historical sites; and a long list of sources. All genealogists face challenges, and African-American genealogy has its own unique set of challenges. Williams proves that these challenges can be overcome, at least by someone with her skills and diligence. Williams could have provided us with more human stories, beyond that of facts and figures. Whenever she did, the stories were wonderful. An example is that of Vella Lassiter, a Strieby school success story. She went beyond Strieby to earn Bachelors and Masters Degrees and spent four decades as a teacher. In 1937, she sat down on a crowded bus next to a white person. The bus driver ordered her off the bus and attempted to remove her. When she resisted, the police were called and it took two officers to physically remove her from the bus. This was 18 years before Rosa Parks did the same thing in Montgomery, Alabama. For the residents of Strieby and the rest of Randolph County, and for the descendants of those who once lived there, “From Hill Town to Strieby” by Margo Lee Williams is an invaluable resource. The historical information will indeed provide a direct connection to generations past.